"Phottix Premium Series BG-D800 Battery Grip for Nikon D800 DSLR features AF/On button, command dials, vertical shutter button and multifunction controller. 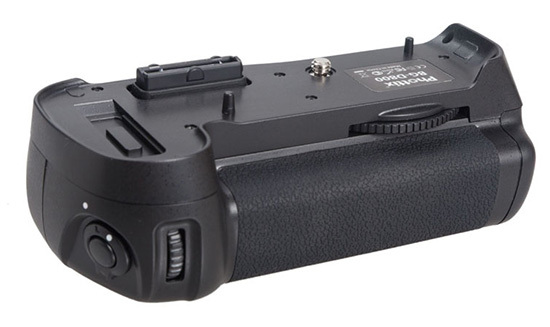 The BG-D800 holds 8 AA batteries or 1 EL-EL15 battery in the included trays. The BG-D800 also provides a comfortable vertical grip with an additional shutter release and scroll wheel for easy access to the camera functions when shooting in the vertical orientation. The grip also has a tripod socket"
Battery Holder for 1x EN-EL15 Battery. Battery Holder for 8x AA batteries. This entry was posted in Nikon D800 and tagged Phottix. Bookmark the permalink. Trackbacks are closed, but you can post a comment.